Nivolumab, een anti-PD medicijn, gegeven aan patienten met gevorderde blaaskanker (urineleiderkanker) na resistentie van op platinum gebaseerde chemo zorgt alsnog voor uitstekende resultaten op progressievrije ziekte en verlenging van overall overleving. Zelfs bij patienten met weinig PD1 ligand expressie hadden voordeel van de nivolumab. Nivolumab gaf een mediane remissie / respons te zien bij 19.6% van de patiënten (N = 270) met uitgezaaide blaaskanker na minstens 1 op platina gebaseerde chemokuur, inclusief 28.4%, 23.8%, en 16.1% respectievelijk bij degenen met een PD-L1 expressie van ≥ 5%, ≥ 1%, en < 1%, respectievelijk. De uiteindelijke resutlaten zullen nog beter worden want de mediane repons is nog niet bereikt op moment van analyse. Maar dat 1 op de 5 patienten alsnog een remissie bereikt is wel goed natuurlijk. 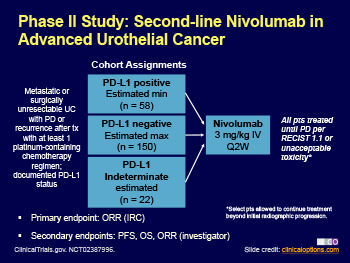 Nivolumab monotherapy provided meaningful clinical benefit, irrespective of PD-L1 expression, and was associated with an acceptable safety profile in previously treated patients with metastatic or surgically unresectable urothelial carcinoma. Patients with metastatic urothelial carcinoma have a dismal prognosis and few treatment options after first-line chemotherapy. Responses to second-line treatment are uncommon. We assessed nivolumab, a fully human IgG4 PD-1 immune checkpoint inhibitor antibody, for safety and activity in patients with metastatic or surgically unresectable urothelial carcinoma whose disease progressed or recurred despite previous treatment with at least one platinum-based chemotherapy regimen. In this multicentre, phase 2, single-arm study, patients aged 18 years or older with metastatic or surgically unresectable locally advanced urothelial carcinoma, measurable disease (according to Response Evaluation Criteria In Solid Tumors v1.1), Eastern Cooperative Oncology Group performance statuses of 0 or 1, and available tumour samples for biomarker analysis received nivolumab 3 mg/kg intravenously every 2 weeks until disease progression and clinical deterioration, unacceptable toxicity, or other protocol-defined reasons. The primary endpoint was overall objective response confirmed by blinded independent review committee in all treated patients and by tumour PD-L1 expression (≥5% and ≥1%). This trial is registered with ClinicalTrials.gov, number NCT02387996, and is completed. Follow-up is still ongoing. Between March 9, 2015, and Oct 16, 2015, 270 patients from 63 sites in 11 countries received nivolumab, and 265 were evaluated for activity. Median follow-up for overall survival was 7·00 months (IQR 2·96–8·77). Confirmed objective response was achieved in 52 (19·6%, 95% CI 15·0–24·9) of 265 patients. Confirmed objective response was achieved in 23 (28·4%, 95% CI 18·9–39·5) of the 81 patients with PD-L1 expression of 5% or greater, 29 (23·8%, 95% CI 16·5–32·3) of the 122 patients with PD-L1 expression of 1% or greater, and 23 (16·1%, 95% CI 10·5–23·1) of the 143 patients with PD-L1 expression of less than 1%. Grade 3–4 treatment-related adverse events occurred in 48 (18%) of 270 patients—most commonly grade 3 fatigue and diarrhoea, which each occurred in five patients. Three deaths were attributed to treatment (pneumonitis, acute respiratory failure, and cardiovascular failure). Reageer op "Immuuntherapie met nivolumab geeft uitstekende resultaten bij gevorderde uitgezaaide blaaskanker - urineleiderkanker"